While we certainly understand and appreciate the idea of employing older Americans as greeters at Walmart, we cringe every time we come across a story of another elderly worker injured after being put in the position of trying to prevent shoplifting. This time, it’s the tale of a 78-year-old greeter from the Southern California city of Murietta, who recently attempted to stop a man from doing his holiday shoplifting and paid the price for her efforts. 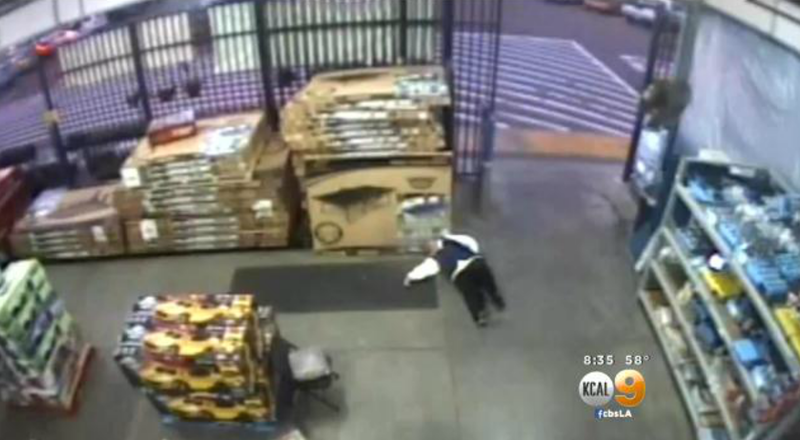 According to CBS Los Angeles, the septuagenarian spotted a man trying to walk out of the Walmart with a computer that was still connected to an anti-theft device, so she asked him for a receipt. As you can see in the below video, the man did little to hide the fact that his plan was to exit the store without paying for the item, but the greeter still tries to get in front of him. They do a little shoplift two-step before the greeter ends up on the floor, injuring her hip in the process, and the thief has left the building. Police say he then exited the parking lot in a car with no license plates. This is just the latest in a string of violent incidents that have ended with elderly Walmart employees being injured. There was the 70-year-old greeter in New York who “flew across the floor” after being punched by a 26-year-old shopper who apparently hadn’t been attempting to steal anything but was just annoyed at having her receipt checked. And then we had the 100-year-old greeter in Wisconsin who had to be hospitalized after being knocked to the floor in a receipt-checking dispute with a customer. Sadly, not every incident ends with just some bumps and bruises. In 2011, we told you about the 71-year-old Walmart worker in North Carolina who died after being involved in an attempt to prevent a shoplifting. So while it’s great that Walmart pays the elderly to smile and greet shoppers when they come in the store, maybe it’s time to leave the exit duty to loss-prevention staffers.